It is very important to improve mobility in the wrist flexors by means of stretching to rid of any restrictions and inflammation being placed through the carpal tunnel where the tendons of the wrist flexors and median nerve pass through. These exercises have been recommended by ergonomics experts for a long time, but some people find them uncomfortable. If these stretches are not comfortable for you, do not continue them. Hold your arm straight at waist height, palm down. 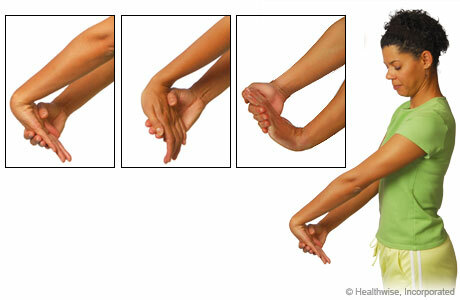 Gently bend your wrist by pressing your hand down. Repeat on the other arm. Hold your arm straight at waist height, palm up. Gently bend your wrist and fingers up by pulling up.